Gracie Klutz selling her PinUps. Photo courtesy of: Gracie Klutz. Gracie Klutz is the Designer and CEO at Klutz Mega Korp. Her speciality is #PinUpsbyGracie, retro inspired headbands with a weirdly wonderful twist. She also spearheads Cirkle K, a collective of Toronto based “makers” who specialize in accessories. “I formed Cirkle K August 2014, to build a supportive network of like minded artists,” Klutz said in an e-mail interview. “Selling something you make is rewarding beyond words. I love paring a PinUp with a happy home,” she added. I had the pleasure of meeting Klutz at the Trinity Bellwoods Flea Market, a place where people who love local products and love to shop come together to support local artists and entrepreneurs in Toronto’s west end. Despite her very busy schedule, Klutz was kind enough to answer a few questions about her company and how she got to where she is today. We are so thankful. Gracie Klutz scoping out new designs. Photo courtesy of: Gracie Klutz. A #PinUpsbyGracie! Photo courtesy of: Gracie Klutz. 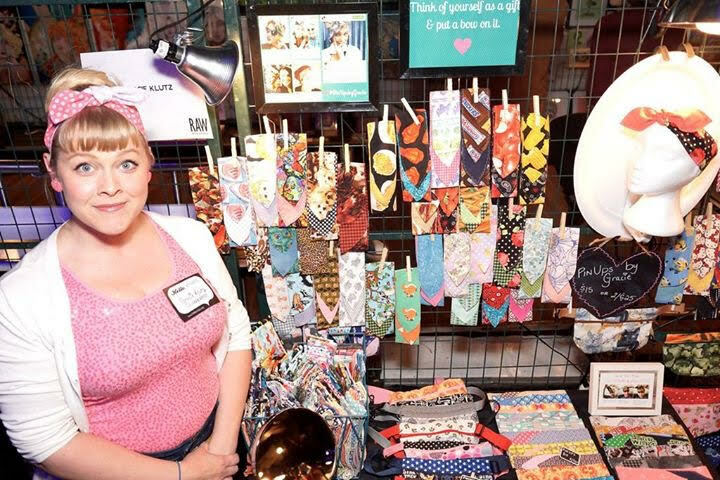 Gracie Klutz at a market, selling #PinUpsbyGracie. Photo courtesy of: Gracie Klutz. Gracie Klutz showing off her PinUps and fabulous bangs. Photo courtesy of: Gracie Klutz. 1. What is a day in the life of Gracie like? A sweatshop day for me is a loud sewing machine and hot iron in my craft room, facing a wall. Wait, that sounds desperate. My craft room is a sweet sized den. It’s cotton candy pink, with a pig in a PinUp, eating a doughnut hanging on the wall. I spend hours by myself stitching, flipping and edging all these handmade lovelies. Then, in the evening I catch up on admin, like applying to festivals and submitting to artist markets…with the occasional blog interview thrown in there. 2. Were you always making accessories? I love accessories! They’ve always been a focus of mine. I remember hearing somewhere that the reason a black dress never goes out of style, is that you can change your accessories to keep it fresh. I also love that no matter how you feel about yourself, a headband always fits. 3. How did you learn to make accessories? I taught myself. My family are all “makers!” My dad, brother, uncle and two cousins are carpenters, my mother crochets, beads, sews, glamourizes and repurposes. My paternal grandmother was an amazing baker and my maternal grandmother was a nurse – which means she stitched humans! We are a family of task oriented-implementors, with a side of hustle. 4. What is the hardest part about making #PinUpsbyGracie? By far it’s picking the fabrics. I have this urge to please everyone, and even though I know I can’t, I still try. Which means I usually end up with WAY too many options that can overwhelm my clients. But I also think it’s my variety that keeps my clients coming back. 5. What was your first job? How has, or hasn’t, your first job helped you in your own business, today? My first job was cashier at a grocery store. I’ve always been a social person, but this forced me to get comfortable with intimate details of people’s lives: their diets, their habits and their bathroom routine. Plus it’s unbelievable what people tell you when you’re touching their things and the kind of relationships that develop from that forced intimacy. That ability to roll with it has definitely helped me adapt in the public forum. 6. Who makes up Cirkle K? 7. How long has Klutz Mega Korp been in business? I started #PinUpsbyGracie at FanExpo 2013. I was wearing a Wonder Woman PinUp that I made for myself and got stopped by so many people complimenting me on my retro inspired nerd gear, and actually sold 15 of them that weekend. 8. What has been the most rewarding experience so far? I love conventions! I love nerd cons, horror festivals and thematic weekend events. They’re my fav. 9. Do you have a store, or do you rely mostly on festivals and markets, like the Bellwoods Flea? I sell at three retail locations: Rosie the Rebel on Bloor St., Loveless Boutique on College St., both in Toronto, and Jackpot Vintage on Dundas St., in London, Ont. I am also an active Etsy seller. 10. How does e-commerce benefit your business? Both Brook and I have Etsy accounts. It’s strange how having an online outlet “legitimizes” a business. Even though people are meeting you in person at an event – they still want the option to shop in their PJs at home. 11. Would you encourage other entrepreneurs and artisans to join festivals and events to sell their products? Why? Fairs and festivals are something I really enjoy. My best advice for startup artisans who want to sell anything, is to sell something you would BUY! I know that sounds obvious, but I’ve met so many frustrated vendors who can’t understand why their products aren’t selling. You can’t convince a shopper to buy something if you don’t know the benefits, unique ways of using your product and have a passion for it. 12. What role does social media play in your business plan? I run promotions through my Instagram, Twitter and Facebook pages all the time. I love alerting my fans to discounts, or new patterns. Being top of mind is important to me. I share everything- including when and where I’m going to be! I’ve had people come to me at an event, requesting the specific item I’ve just promoted. 13. Which is your favourite social media platform to use and why? For me, it’s Instagram. A picture is worth a thousand words, then I get to add hashtags? WHA?! My product sells best when people can see it. Recently, I’ve started collecting images with the #PinUpsbyGracie hashtag and using them (with permission, of course) in my table top promotion. Again, it’s that sense of legitimacy, people recognize the Instagram brand, and seeing different faces rocking their unique PinUps, emboldens new clients to rock their own…and Tweet about it! Thank you to Klutz for taking the time to share her story with us! Find Klutz on her social media profiles linked above.